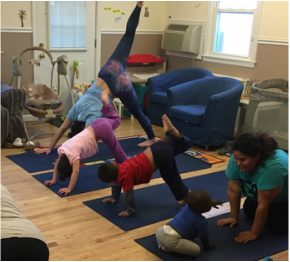 United We Om will offer Yoga and Meditation in a home in Merrick for teenage mothers. This will encompass the young mothers and their children in residence at the house, the caregiving staff, as well as the alumni community. The classes will include the children, who range in age from a few months old to 5 years old. The goal will be to provide a calm and intimate time for the mothers to bond with their children, as well as an opportunity for the mothers and staff members to gain a common set of tools to help improve communication and reduce unproductive reactivity and stress in the residence. We will also offer a class at the residence's spring party which brings together the entire alumni community with the hope of encouraging mothers who are no longer in residence to attend the weekly classes. ​The yoga classes will include breathing, books, songs and asanas to offer a way in to the practice for participants of all ages! Teacher Sasha Petukhova feels "yoga practice is a set of techniques or methods for self healing, self discovery, self empowerment and ultimately self realization. Tools that can be life changing, life saving for the underserved communities. Tools that can help discover inner peace, inner strength and joy no matter what the life circumstances are." Firm believer that asana (postures) doesn’t constitute yoga, Sasha is also knowledgeable about other aspects of yoga practice such as pranayam ( breathing techniques), yogic diet, chanting, proper relaxation, positive thinking and meditation, yoga scriptures and teachings. Strong and caring, Sasha encourages students to smile and focus on their breath as they move through a class. After completing her 200-hour yoga teacher training, she began teaching yoga to students of various ages, physical fitness levels and backgrounds. Sasha is also certified to teach kids yoga, and prenatal yoga classes. She is forever grateful to her teachers Sri Dharma Mitra, Yoshio Hama and Prem Sadasivananda, Swami Sivananda and Swami Vishnudevananda and Ram Das for their guidance, support and wisdom. Sasha believes, that through various techniques of Yoga, we can strengthen and heal our bodies, grow emotionally, learn to control our minds and finally unveil the soul. It is through the constant practice that we can begin to experience many gift of yoga, the most cherished – compassion and humility, and understanding that deep inside we are all the same! All one!